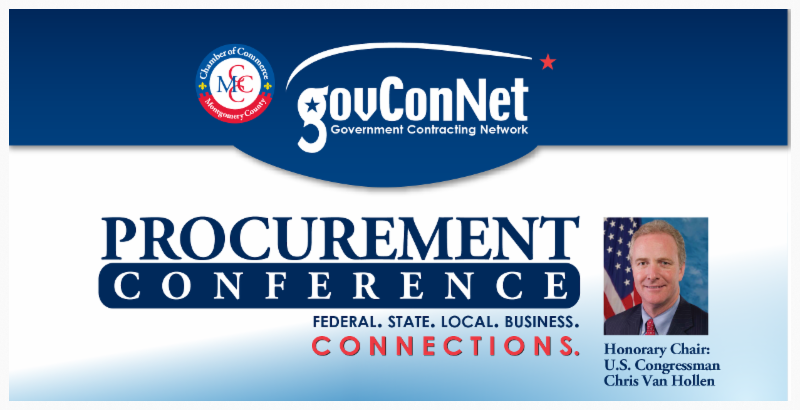 The 2016 MCCC GovConNet Procurement Conference was a great day of commerce! May 12,2016 – Hundreds of attendees took advantage of the unique opportunity to gain valuable insights and meet directly with key purchasing agents from a variety of federal government agencies, prime contractors, and state and local agencies. U.S. Congressman Chris Van Hollen served as the Honorary Chairman for the thirteenth year, noting the great opportunities that Maryland businesses have in the area of procurement goods and services. Anne Rung, Administrator for the Office of Federal Procurement Policy (OFPP) at the White House Office of Management and Budget, provided keynote remarks. She shared her expertise on the procurement process from the perspective of the client – the Federal Government. The opening ceremony also featured a keynote panel on small business regulation updates. The panel was moderated by Tony Franco, Senior Partner at PilieroMazza PLLC, and the panelists were John Shoraka, Associate Administrator of Government Contracting and Business Development at the U.S. Small Business Administration, and Emily Murphy, Professional Staff Member and Counsel at the U.S. House of Representatives Committee on Armed Services .